What's biting: Mahi Mahi , tuna fish, wahoo , sailfish. Good evening hear from Drop Down Sport Fishing Charters in the beautiful town of Saint Augustine Florida. The weather is warming up nice and the offshore fishing charters have been pretty consistent with a variety of species biting. The shorter deepsea trips have been producing red snapper, vermillion snapper, and Cobia. On the longer gulfstream trips where catching Mahi tuna fish and wahoo. If your trying to catch these kind of pelagics now is the time of year to do it. Give us a call and we’ll get you set up. Let’s go fishing on Drop Down Sport Fish Charters! Good morning from Drop Down Sport Fish Charters here in the oldest city St. Augustine Florida. It’s been pretty breezy this week for the most part, but that hasn’t stopped Drop Down Sport Fish Charters. We’ve had a couple inshore fishing trips this week with decent results. A few slot size red fish to keep, a bunch of smaller rat reds, along with keeper size sea trout and flounder. I’ve been catching these fish all over the icw but more bites on the shoreline with some current. As for deepsea and offshore fishing out of St. Augustine Florida , the water is still green and cold, But that’s all about to change. There where lots of sailfish caught last week so the offshore pelagics should be any day the first wave of mahi and tuna Fish will be coming threw. Focus on the water temperature change and fish there, there should be plenty of action. If not then find any changes in the ocean from water temp, to water color, to structure such as weed lines or debris. A floating log or pallet is almost guaranteed Mahi mahi. If your looking for a inshore Or Offshore Fishing Charter call Drop Down Sport Fish Charters for premier charters in st. Augustine Florida. The bite has been hot here on Drop Down Sport Fish Charters in the beautiful sunny city of St. Augustine Florida . Inshore fishing for redfish on the low tide has been a consistent bite. I have been throwing live bait when it’s around, and a dark swimming minnow with a charturse tail. Focus on a spot with some structure and current or moving water. As for offshore fishing, wahoo have been getting caught and are around. Watch the weather and put in your time, you can land a trophy strip fish this month. St. Augustine Florida is one of the best places to fish for a variety of species inshore or offshore fishing. Call us on Drop Down Sport Fish Charters to book a fishing charter and let’s go fishing!! Good morning from Drop Down Sport Fish Charters located is the beautiful historic town St.Augustine Florida. This time of year the ocean is usually cold, windy, and choppy for the most part. Northern fronts coming down are weekly, But keep your eye on the weather for a flat day and the rewards could be great. Big Wahoo is most likely on everyone’s mind when fishing January and February. High speed lures are effective deepsea fishing because more than likely when you get a bite at 14-17knts it’s going to be a wahoo. You can also cover alot of ground and allow the anglers to Fish miles of ocean. If the bottom fishing is more your take, Cobia And vermilion snapper are still swimming around. Try and find a water change or temperature change when looking for Cobia. Summer will be here before you know it so make some plans and give us a call and let’s go fishing on Drop Down Sport Fish Charters! Its a new year and where already having some good fishing on Drop Down Sport Fish Charters located in the beautiful historic town St. Augustine Florida. Grab some jigs and get offshore, the Cobia have been swimming around off shore the east coast of St. Augustine, Florida. The weather has been tricky, scary and dense fog with visibility of 50ft. Once out to the fishing grounds the bottom bite has been pretty wide open, vermilion Snapper and giant red snapper on every drop. When targeting Cobia I like to pull the anchor and drift fish. Bounceing around to different spots covering ground and depth of water. Jigging with a nice size spinning reel and 20-40lb class rod with jigs is a productive way to fish for Cobia. St. Augustine Florida has been a go to inlet for decades to fish offshore and hunt for the elusive salt water catfish. Always have a live bait somewhere on the boat just in case the fish are finicky, you have another option. If trolling is more your take, then wahoo fishing may be for you. The biggest wahoo of the year are caught in the winter offshore months off the coast of north east Florida. Up to 100lb fish have been caught and 50-70lb is common. High speeding seems to work pretty well for getting the bigger bite too. 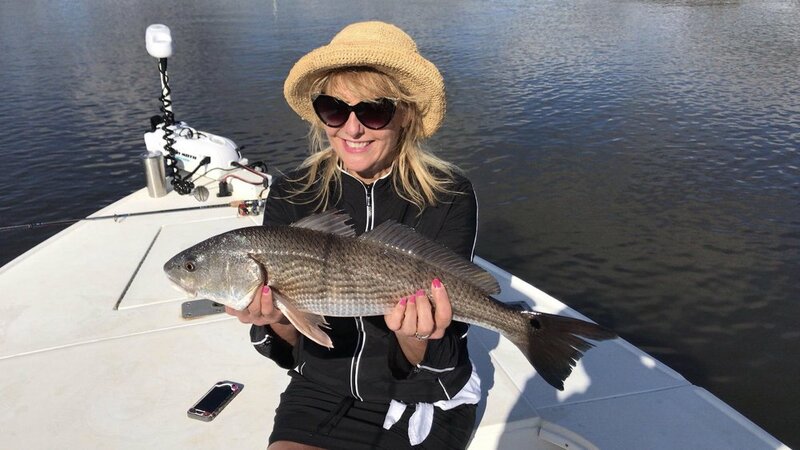 The new year is here, where taking reservations and dates are filling up fast so make your plans and let’s go fishing on Drop Down Sport Fish Charters in the oldest city St. Augustine Florida! !